Jenn Falk and Steph Zabel! This retreat will overlap both with our shift into the Autumn season, and the year's most powerful Super (Full) Moon! As healers and life long friends, we first traveled to this magical land back in 2008. It is a soul home for us and we are honored to be able to share our knowledge of yoga and the plant world coupled with our enthusiasm for this beautiful country! This retreat is for all looking to tune into their creativity and for nurturing time spent in the Icelandic countryside next to the sea, lava fields, waterfalls, and a high vibrational glacier. 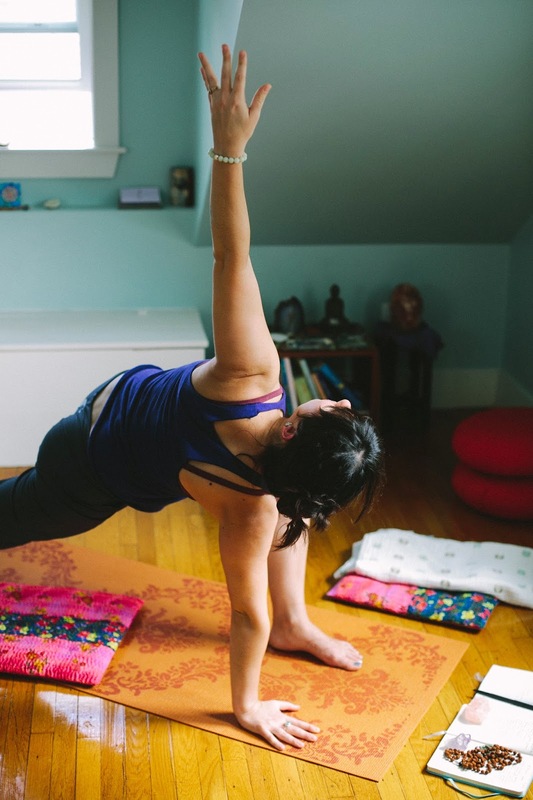 Jenn will lead daily yoga and meditation for all levels of practitioners. We will combine hatha, vinyasa, yin, and mindfulness techniques to bring our attention to our presence in every moment. This will be Jenn's 7th trip (3rd yoga retreat) to Iceland. It is truly her heart's home and she absolutely adores sharing it with friends new and old. Steph will guide us through daily learning adventures with the herbal world. We will learn local flora on some hikes and plant walks, and also spend time crafting teas and learning about how to heal ourselves body/mind/spirit through plants. Limited to 10 people for an intimate energy. (2 friends wanting to share, or a couple). The $2950/person price means rooming with someone. We will greet you at the airport, have breakfast there and get acquainted before heading to the Blue Lagoon to rejuvenate for a couple hours after travel. We will head from there straight out to West Iceland (approx. 2 1/2-3 hour journey taking in the beauty of the land) to our gorgeous hotel on the Snaefellsnes Peninsula. We will settle in and have a snack, then take time for a welcome meditation/opening ritual and short practice before our first dinner together. Friday morning we then head to the northern tip of the peninsula to Stykkisholmur, where we will move into to a lovely bed and breakfast/apartments. Here we will continue with similar energy. We will get to practice yoga in the amazing Library of Water both days, soak in our own hot tub and/or use the town's wonderful swimming facilities, have more hikes and explorations, and magical classes on plants! Saturday night we will honor the Full Super Moon with ritual. On Sunday we will depart for Reykjavik for our last moments together as a group. We will take a special walking tour of the city with the fantastic I heart Reykjavik walking tour! We will have lunch together and will close with a short meditation. At this point you can decide to stay on in Reykjavik to explore on your own (we will help you find lodging before the trip) or we can organize your departure back to the airport. **Please note that Icelandic weather can be extremely unpredictable. This means our daily activity for hikes or excursions may change last minute if conditions are limited. This is part of the beauty of the land and all participants will need to stay open to this possibility. Thanks! Please be in touch with any questions or to hold your spot!! Full Moon energy is always the time during the cycle of a month for reflection and realization. I recently realized it was 9 winters ago that I began my yoga teaching journey, after 4 years of practicing yoga. I remember those early days well and it's both felt like I've been teaching forever, and yet hardly long at all. These years have taught me so much! I'm truly lucky I found my passion at a young age, and I can't wait to keep growing older and wiser along with it. Here are some thoughts of what almost a decade of teaching yoga has taught me. -i am my own best guru, teacher, and guide. we need a teacher or teachers to provide us mentorship, inspiration, and support, but my intuition provides exactly what my deepest insights to my own body and spirit need. -ebbs and flows are natural and real while doing what you love. just stay curious about inspecting the ups and downs, and stay present through it all. -making mistakes are keys to your future and your journey to being great. own up to them even when hard. some people might not take it the right way or understand when you do own up to them, but that's not about you. just stay honest and true to yourself. -if i help just one person feel better in their body, mind, or spirit, then i'm doing the work. it doesn't matter that i haven't taught to huge groups, or at big events. it doesn't matter to win recognition or be an ambassador for something. i used to think so some years ago because our society places value on such things and we can get trapped in that mindset as a limit of our worth. i am my own ambassador of my unique magic to share the practice of yoga for what it is to me. -i almost helped start a teacher training but my first son came instead. this was the path of higher learning i needed at that time--motherhood. and who knows if i will help lead a training someday. what i do know is that i've helped countless students who have walked into my classes feel inspired to become teachers themselves, or deepen their studies with a training. that is my privilege on this path and i am grateful to see so many thriving, as yoga continues to grow, grow, grow. -i've evolved as a teacher and student. as we learn more about the body, our minds, and how yoga effects us as humans, the way we teach must also evolve. at the same time, i'm still me. i still teach with the moon cycles and seasons, and i still care about energy and emotional states. -i've learned how to monitor myself. how to be of care to myself in all aspects. how to keep my teaching and practice sustainable for me and my family. how to be interested. how to be compassionate, forgiving, generous, humble, grateful, energized, relaxed, empty, full, honest, joyful...and so on. i've been burnt out before and know how to recognize when it could come on. i honor that now and take the time. like right now...as a mom to 2 littles, i know enough about myself that i can't teach a lot and still be the mom, wife, teacher, and creative that i want to be. this is my current cycle and the time will come again to bring things up a notch. -i've discovered and continue seeking what i'm passionate about as a teacher. i've learned that i love teaching to women of all stages. i love leading retreats in places i have a deep connection to because it makes for a transformative, deeper retreat. i love collaborating with other teachers. i love sharing parts of how i teach, practice, and live on social media because it forms a connection and builds trust. i love helping people love themselves and staying open myself about the fact that i'm always striving for the same. i love interesting music for class. i love lots of yoga styles and don't hesitate to bring them together when needed. -always listen to your body. just because you did something 9 years ago or 2 years ago, doesn't mean it's right for your body right now. we are meant to change, age, learn from injuries, go through pregnancies, or whatever else causes your practice to change. resist trying to push yourself through just to attain what you think is perfect. there is no perfect, there is only you. -pay attention to what you're good at. i'm both shy and friendly/outgoing. gentle and strong. quiet and loud. it always depends on the situation, the environment, the surrounding energies. this is part of my own makeup and it means that I excel depending on those things, and my current state of personality. we are complex beings, and when i try to be something i'm not, it doesn't work. students notice it and you will too. teach whatever and however you are meant to shine. this could look 360 degrees different than the next teacher that walks into the studio, and yet you might get some of the same students. that's the beauty of it. -try not to take things personally. because you're growing, learning, changing, and being you...people will come and go from your classes. they might have jived with you then, but not now with your new ways of sharing your practice and that's totally cool. often, you may find them coming back down the road or you yourself changing back to the old ways again at times too. it's all good. -take risks. i've learned so much when i've just tried something. maybe a new sequence idea, or new way of describing something in class. sometimes it may not work, but you have to find out. and with retreats...i knew that i could create a wonderful experience, so i just went for it. sometimes i've only gotten a handful of people but it's still worked and allowed me to learn so much. bottom line--just do it. Sending Love out to all of you out there aiming to do what you love and continue pushing forward to achieve it! "You may doubt it, but the Leo Full Moon has news for you: you are not a satellite, not a reflection of anyone else. You are the Sun, filled with your own light, golden and warming, spilling out around the edges when your guard is down. When you laugh, your eyes sparkle. When you speak from your heart, you’re thrilling to behold. Just look at you. You are filled with your own light."